Vivian Gail (Fuller) Nichols - age 84, Morristown, Kings County passed away, surrounded by her family Tuesday, March 12, 2019 in the Valley Regional Hospital, Kentville. 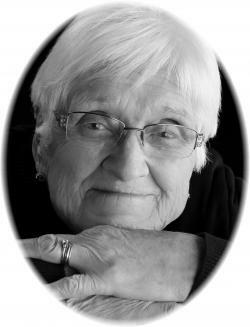 Vivian was born on April 7, 1934 in Hortonville to Howard and Beatrice (Borden) Fuller. A proud wife, mother, grandmother, and great-grandmother, Vivian loved the community of Morristown and contributed to it in many ways. Following her graduation from Mack Business College in Kentville, Vivian worked in Halifax before she met and married the love of her life, Vaughn. She worked tirelessly alongside her husband as they farmed together and took particular leadership in the growth of the family’s blueberry u-pick, where she maintained relationships with many customers over the years. Vivian was a member of the South Berwick Women’s Institute, the Morristown Mountain Peakers, and the Morristown Baptist Church, where she served faithfully to provide hospitality and care to children and adults alike. Vivian valued love as the greatest virtue, and she showed it through her constant, self-giving love for her family members, especially her husband with whom she shared sixty years of married life. Her concern was always for the well-being and activities of her family, above her own. She provided strength for all of her family members in hard times and took great pleasure in gathering them all together for special occasions and celebrations. She took life as it came, and weathered its ups and the downs with assuredness and wisdom. Surviving are her children, Douglas (Marlene) Nichols, Marla (Danny) Gould, and Craig (Norma) Nichols; grandchildren, Stuart (Julie) Gould, Robert, Allyson (Ricky) Sawler, Elaine (Willem) Schep, Elizabeth, Daniel, Samantha, Spencer and Sydney; great-grandchildren, Lilly and Roxanne Gould; sister, Edith Hicking; and sister-in-law, Barb Fuller. In addition to her parents, Vivian was predeceased by her loving husband, Vaughn; and siblings, Clarence, Harlen (Kathleen), Howard, Gertrude (Ross Mackenzie) and Florence, in infancy; foster brother, Don Patterson; and brother-in-law, John Hicking. The family would like to extend their most sincere thanks to the excellent ICU staff at the VRH, as well as those who assisted in her time of need. Cremation has taken place. Visitation will take place from 6-8 p.m. on Friday, March 29, 2019 in the White Family Funeral Home, Kentville. The funeral service will take place at 2:00 p.m. Saturday, March 30, 2019, in the Morristown Baptist Church, Reverend Chad Clements officiating. A reception will follow in the Morristown Community Centre. Burial will take place in the Morristown Cemetery. Donations in her memory may be made to the Morristown Baptist Church or a charity of choice. Funeral arrangements have been entrusted to the White Family Funeral Home and Cremation Services, Kentville.